During this art session, we’ll work on a painting similar to this one. Now the question remains, what is the fruit of the vine Jesus requires from every believer? Some might say ministries such as teaching, pastoring, motivational speaking, and counseling. Others might think the fruit comes in the form of serving others as in nursing/doctoring, feeding the poor, and rearing children. While all these things are good works for which we were saved according to Ephesians 2:10, they are merely the byproduct of the fruit much like juice, jelly, and jam. The Bible makes it clear the fruit of the Spirit, the fruit Jesus requires of the believer is love. Within love we’ll find joy, peace, patience, kindness, goodness, faithfulness, gentleness, self-control. No matter what situation or occupation in which we find ourselves, Jesus requires love. Again, love consists of joy, peace, patience, kindness, goodness, faithfulness, gentleness, and self-control. 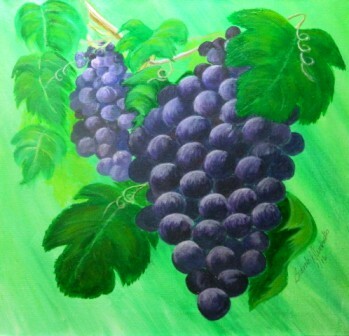 Just as the branch on a grapevine produces one fruit—grapes—and the grapes consist of skin, juice, fiber, and seeds. We also produce one fruit—love. With that said, when you feel unproductive by the world’s standards in regards to a ministry, vocation, or charity, rethink the problem. Are you a fruit-bearing branch according to the Bible? Do you approach life, those with whom you come in contact, and your current circumstances with love? Where are you on the joy, peace, patience, kindness, goodness, faithfulness, gentleness, and self-control Richter scale? We may not have the position in this life we’d like to have, but if we’re working on love with all its components, we are in good standing with Jesus. However if we have lofty positions in our churches, at our workplaces, and in our communities and display little love for others, we may be in danger of being disconnected from the Vine. If I speak with the tongues of men and of angels, but do not have love, I have become a noisy gong or a clanging cymbal. If I have the gift of prophecy, and know all mysteries and all knowledge; and if I have all faith, so as to remove mountains, but do not have love, I am nothing. And if I give all my possessions to feed the poor, and if I surrender my body to be burned, but do not have love, it profits me nothing (1 Corinthians 13:1-3). Let’s be fruit-bearing branches. Let’s love one another as Jesus has loved us.